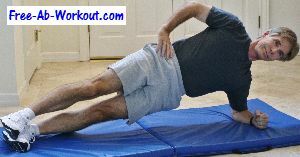 The 10 Minute Abs Workout is a great way to work your abs in a short period of time. Who can’t find 10 minutes in a day to work their abs? This 10 minute workout consists of 5 exercises that work your abs and core fully. They can be done anytime, anywhere, and without any equipment. Whether you're at home, at the gym, or on the road, there are no excuses anymore for not having hot, toned abs. This is not a workout for beginners. You need a fair amount of ab and core strength to do it properly. The 10 minute abs workout consists of 2 sets of each exercise, for a total of 10 sets. Do 1 set of each exercise in order, 1-5, without resting in between. After completing all 5 exercises, rest for one minute, then repeat the 5 exercises in the same order. Don't do the same exercise back-to-back. A 10 minute workout and your abs are blasted. Assume a pushup position with your body forming a straight line from your shoulders to your ankles. Bring your right foot up under you as far as you can and place your foot up toward your right hand. Return to the starting position, then do the same thing with the left foot. Alternate legs until you complete 10 reps for each side. - Keeping your core braced and your body in a straight line. No hip sag. - Exhaling as the knee comes up to the top, inhaling on the return. - Keeping a steady pace. Don't rush it like you’re running uphill. Lie on your left side, body in a straight line, resting on your left forearm, with your right hand on your hip, feet stacked on top of each other. Lift your hips up into the air until your body is in a straight line from your shoulders to your feet. The only parts contacting the mat are your forearm and the outside of your foot. Don’t let your hips sag. Hold at the top for 30 seconds, then switch to the other side. - Breathing throughout the exercise. Don't hold your breath. - Keeping your body in a sideways position, with eyes looking straight ahead. Imagine if your back was up against a wall. Start with your hands and knees on the floor, palms flat, knees shoulder-width apart. Brace your abs and raise your left arm and right leg at the same time until they’re in line with your body. Pause for one second, then bring your right knee up to meet your left elbow directly under your body. Return to the straight arm and leg position, pause for one second, then repeat. Complete 10 reps and then switch to the other side (right arm/left leg). - Using a smooth controlled movement. Don't rush it. - Exhaling as you crunch under your body, inhale as legs and arms straighten. - Only lifting your arm and leg to a height even with your back. Don't go higher than that. - Flexing your foot and straightening your arm as your really reach and extend from both your arm and leg. Assume a pushup position with your weight on your forearms instead of your hands. Elbows should be bent at 90 degrees and directly under your shoulders. Your back should be level. Keep your head in line with your body and spine in a neutral alignment, bracing your abs throughout the hold. - Breathing throughout the held contraction. Don't hold your breath. - Holding your body in a straight line. Lock in a solid position without sagging in the middle. - Bracing your abs as you hold the position. Squeeze your glutes at the same time. Lie flat on your back, thighs perpendicular to your torso, lower legs parallel to the floor, fingertips placed lightly behind your ears. Extend your right leg out at an approximately 40 degree angle from the floor, while simultaneously bringing your left knee in. Use your abs to twist your right shoulder and elbow up and across your body toward your left knee. Touch your knee with your elbow if you can. Reach only as far as you can without straining. Lower yourself back to the floor, then repeat the movement for the other side. - Using a smooth, continuous fluid motion. Go slow. Don't rush. - Exhaling on the lift of each movement. - Not pulling on your head. Keep a tennis ball size distance between your chin and your chest. Go through exercises 1-5, rest one minute, then repeat them in the same order. Do the 10 minute abs workout 2-3 times a week. Be sure and change up your ab workouts every 4-6 weeks for best results.